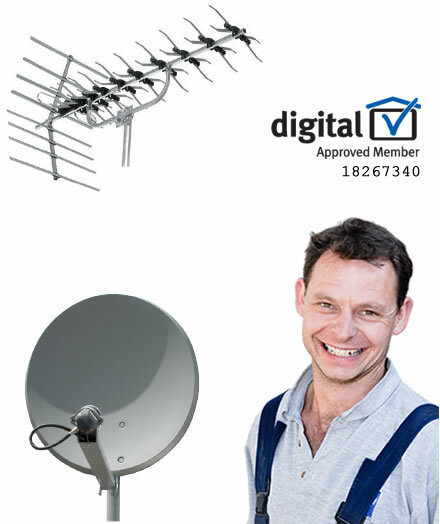 Look no further for all your Digital and Satellite TV services, from tuning and specialist equipment to aerial installation and adjustment. BMC Digital Services are your local experts, with over 25 years' experience. We work within the surrounding areas of Poole, Bournemouth and Christchurch areas not forgetting our customrs in Dorchester and the Purbecks. BMC Digital Services are authorised engineers to work alongside Bang & Olufsen who regularly use our services within Dorset and Hampshire. Whatever the premises may be, a residential house or bungalow, a block of flats, hotel, pub or other commercial premises, BMC Digital Services are the right people for the job. Our NVQ2 qualified engineers have the knowledge and experience to install and maintain the most complex systems as well as the most straightforward. BMC Digital Services are a member of 'Buy with Confirdence', in addition to this all personnel are all CRB checked and all are certified in "Safe Working at Heights" so you can feel comfortable having them around. After so many years working with TV aerial and satellite systems there are few, if any, challenges we have not previously met and overcome! You may not be entirely sure what it is that you actually do need, if anything! Talk to us. Our advice costs nothing. You certainly wouldn't be the first person we have advised that they either don't need anything or perhaps just a minor adjustment to what they already have! We all watch TV too (When we get time!) and we understand how passionate people are about their favourite programmes whether it's football, soaps, documentaries or other programs, and how frustrating it can be when technical problems interfere with viewing. It's our mission in life to have everyone enjoying their TV programmes without irritating distractions. That can only be achieved by using top quality equipment and materials, expertly installed and maintained. That's where BMC Digital Services come in! Calling us today could make all the difference to your viewing pleasure.